You'll be £19.99 closer to your next £10.00 credit when you purchase The Fatal Decisions. What's this? Six key Second World War conflicts where decisions of the Nazi dictator Adolf Hitler contributed to his eventual downfall. Each theatre of operations written up by a German general who was on the spot and involved in carrying out the uncompromising orders of the Führer. This is an 'other side of the hill' collection of accounts which gives valuable insight into the machinations of a sycophantic hierarchy immediately surrounding Hitler. Instead, had the dictator paid heed to his highly competent commanders rather than his toadies the outcome would have been very different for every one of us. Happily for the world, he thought he knew best, selecting counsellors closest to his uncompromising heart. 1. Battle of Britain is told by Werner Kreipe, Chief Operations Officer, Third Air Fleet, December 1939 - June 1940. 2. Battle for Moscow Günther Blumentritt, Chief of Staff in 1940. Later Chief of Staff of Army Group D. In 1944 he command of 12th SS Korps and in 1945 Commander of First Parachute Army. 3. Battle of Alamein Fritz Bayerlein, 1941 Chief of Staff Afrika Korps. Commander of 3rd Panzer Division and finally Panzer Lehr in 1944. 4. Battle of Stalingrad Kurt Zeitzler, Chief of Staff XXII Korps, 1940 to 1941; Chief of Staff Army Group D, April 1942; Chief of the Army General Staff, 1942 to July 1944. 5. Normandy Bodo Zimmerman General Staff in 1939 and Chief Operations Officer to Commander-in-Chief West from 1940 to 1942; also to Army Group D from 1942 to 1945. 6. Battle of the Ardennes (Bulge) Hasso-Eccard von Manteuffel Commander of the Fifth Panzer Army. Siegfried Westphal with his narrative connects the six accounts. During the war Westphal served as Operations Officer under General Erwin Rommel in North Africa, Chief of Staff under General Albrecht Kesselring in Italy and Chief of Staff to General Gerd von Rundstedt in 1944-45, therefore admirably qualified to draw the accounts of his once fellow serving officers together to give a vivid picture of military life under, arguably, the most vicious dictator the world has ever known. Originally published in 1956, this book presents a collection of essays documenting six of the key offensives of the Second World War where the decisions of Adolf Hitler are examined in depth. Each of the theatre of operations is written up by a former German military leader who was integral in carrying out the orders of the Fuhrer at the time - Werner Kreipe, eventually promoted General der Flieger, discusses, for example the events surrounding the Battle of Britain. A fascinating insight into the course of the Second World War. Originally published in 1956, this book presents a collection of essays documenting six of the key offensives of the Second World War where the decisions of Adolf Hitler are examined in depth. Each of the theatre of operations is written up by a former German military reader who was integral in carrying out the orders of the Fuhrer at the time - Werner Kreipe, eventually promoted General der Flieger, discusses for example, the events surrounding the Battle of Britain. A fascinating insight into the course of the Second World War. The middle part of the book contains a number of photographs of good quality of the main persons of the book and of some battlegrounds. A remarkable set of accounts from rather unique point of view and therefore of historical value. This is a fascinating collection of articles, which provide us with an invaluable insight into the attitudes and experiences of the high command of the German Army – just watch out for the self-justification. Originally published in 1956, this reprint collects together a mix of exceptionally rare and discerning essays documenting six of the key conflicts of the Second World War where the decisions Hitler made contributed to his eventual downfall and Germany’s defeat. Absorbing and fascinating, this is sure to appeal to military enthusiasts. 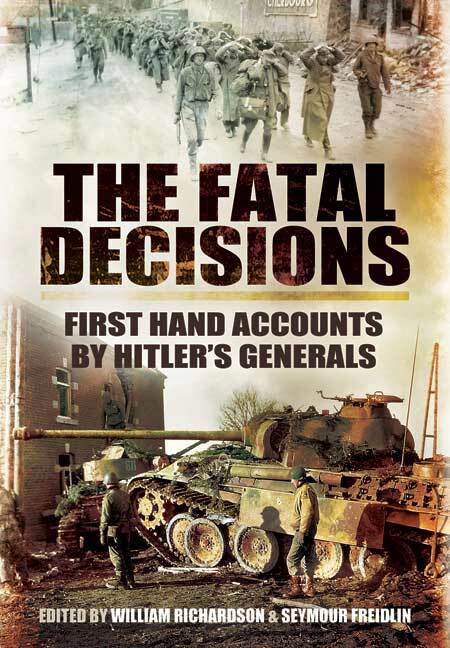 Written by some of the most notable generals of the period, including Werner Kreipe, Gunther Blumentritt and Bodo Zimmermann, the accounts cover the pivotal turning points of the war from the battles of Britain, Moscow and Alamein to those of Stalingrad, the Ardennes and the Normandy invasion. A superb book of six essays written by German generals, each providing an account of their involvement in campaigns which ultimately ended in defeat. Werner Kreipe describes the Battle of Britain, Günther Blumentritt the Battle for Moscow, Fritz Bayerlein profiles El Alamein, Kurt Zeitzler the disaster at Stalingrad, Bodo Zimmerman describes Normandy, Hasso von Manteuffel the Ardennes, and Siegfried Westphal writes the narrative which connects each of these accounts to the next. Their reports give an extremely clear description of the problems which faced the German forces in each theatre, and they are quite frank in chronicling their numerous exchanges with Adolf Hitler. Convinced of his own genius, Hitler continually interfered in military matters, and his amateurish judgement became even more and catastrophically involved as the war began to turn against him. Had he been inclined to heed their sound advice and act on their recommendations, it is possible that victory could have been achieved or else entirely probable that defeat would not so painful. As it was, he never lost confidence in himself and instinctively blamed failure on incompetent generals and soldiers; all of whom, it is quite clear, did everything in their power to carry out his flawed orders to a successful conclusion. A fascinating read, highly recommended."